Flavorful country style pork ribs are a tasty and tender cut of meat that comes from the forward end of the loin area, just above the shoulder of the porker. 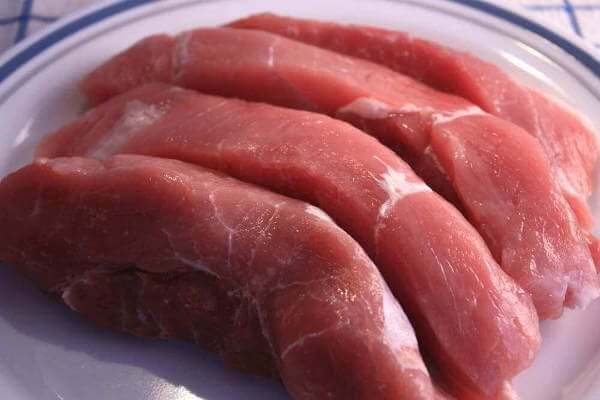 They can be boneless or bone-in, and usually contains a fair amount of fat, which adds to the flavor and helps them remain juicy. The nice thing about this cut of pork is that the ribs can be smoked for hours, bringing the internal temperature up into the 190˚ to 200˚ Fahrenheit range for fall-apart tender meat -- think pulled pork. Or they can be cooked for a shorter length of time and served when they reach medium rare, at 145˚F. I season these ribs with a dry rub, and then let them rest in the rub for at least two hours before they hit the smoker. Here's my recipe and method for whipping up a batch of these tender morsels. Mix all of the dry rub ingredients, and then evenly coat the mixture onto the ribs. Cover and refrigerate them for at least two hours...overnight if you can. These ribs are usually cut thick, so resting overnight is not too long. Bring your smoker up to 225 degrees, and add your favorite smoking wood. Position the ribs so there's plenty of space between them for the smoke and heat to circulate. It will take from three to six hours for them to get to the "falling apart" stage of doneness. Pork has to reach 145 degrees before it is considered done, but a higher internal temperature will make it much more tender. When they reach 180 degrees, they'll melt in your mouth, and that's just what you're looking for now, isn't it? 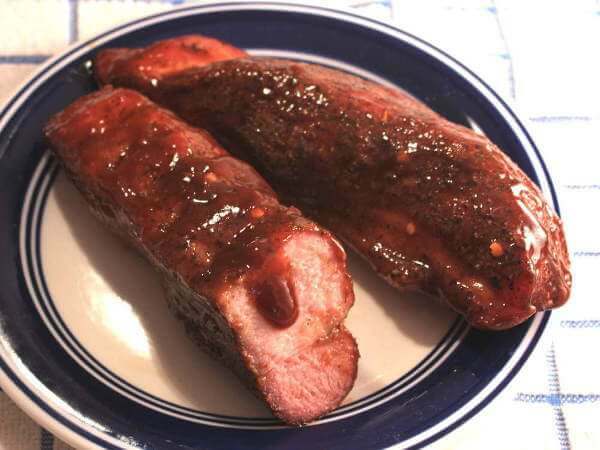 Try this KC style sauce on your ribs next time you smoke them. Country style ribs and sauce make for a good combination. And with a mound of coleslaw, a pile of fries, and a jug of sweet tea, you'll think you went to Hog Heaven! This country style pork ribs recipe has flavor that has a little kick! Red pepper flakes are one of the rub ingredients... and also, a few pepper flakes are added to the vinegar based basting liquid. Those puppies look pretty good, don't they? For this recipe I chose boneless ribs, and picked out the ones that had the least amount of fat. With this recipe there's no need of the fat because they'll be cooked to an internal temperature of just 145 degrees. Cooked to that temperature, any fat in the ribs wouldn't have a chance to melt. The rub recipe I chose for this batch of ribs includes a variety of aromatic herbs and spices, and gives the pork great flavor. 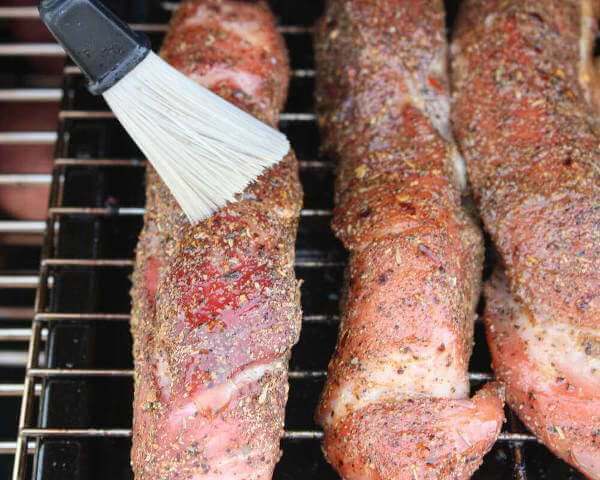 Thyme, rosemary and oregano are just a few of the special ingredients included in this rub recipe. 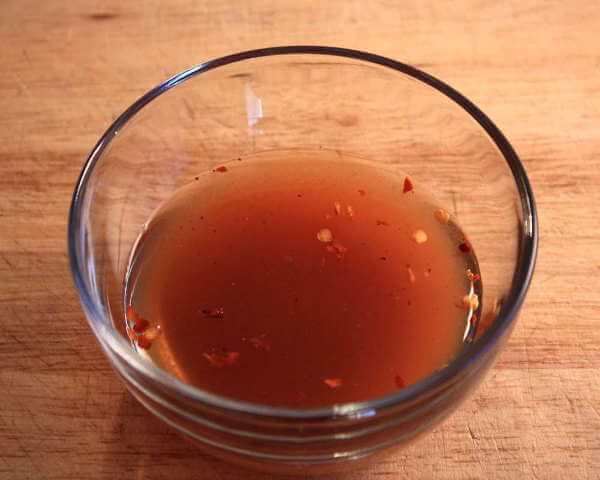 Vinegar sauce is a traditional basting sauce for many different cuts of pork. It's one of the signature flavors of a well smoked pork shoulder. 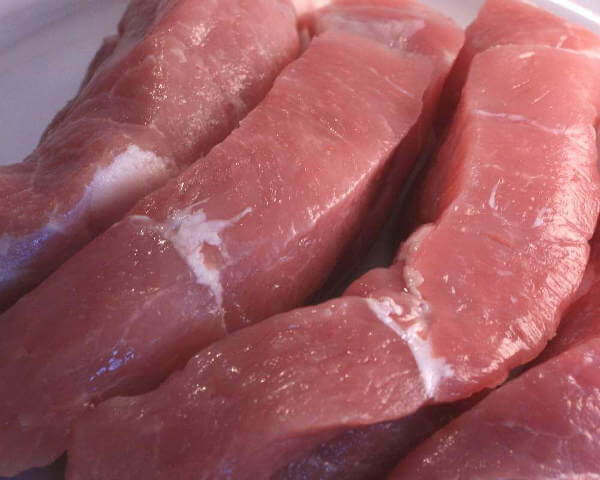 It's also great when used as a dipping sauce, or sprinkled on shredded pork before using it in sandwiches. Get Those Ribs In The Smoker and Start Basting On The Flavor! Now it's time for some smokin'! 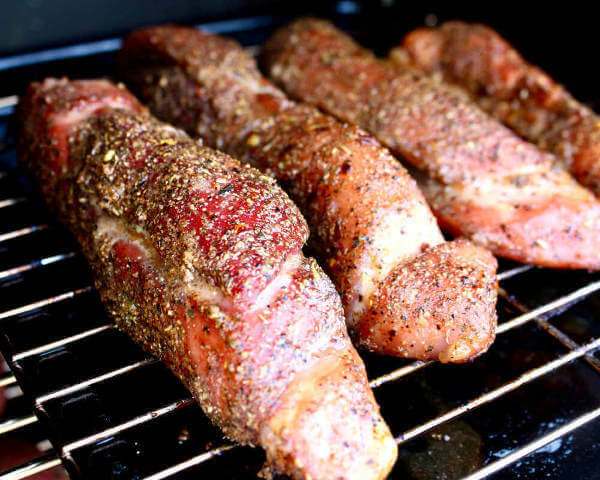 Place the ribs on the upper rack of your smoker, using your favorite smoker wood chips or chunks. 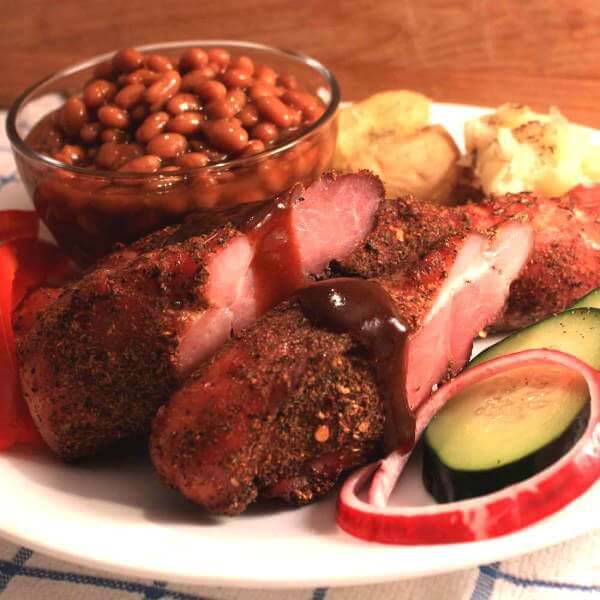 Hickory smoke is another traditional pork flavor, so that's what I typically use. Other good smoker wood choices would be apple wood or pecan wood. Give the smoking country ribs an hour or so head start before you start brushing on the vinegar sauce. Basting once every half hour as the ribs smoke is about right. 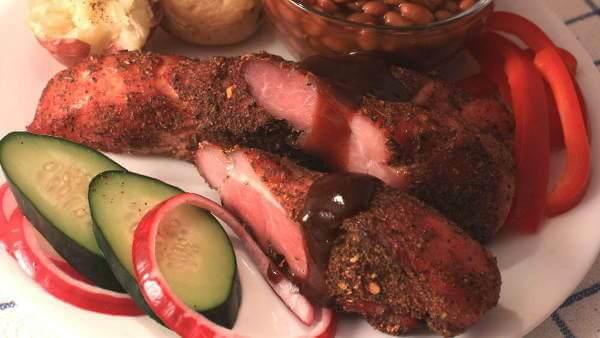 Serve Those Beautiful Smoked Country Style Pork Ribs! As you can see, I had an enjoyable meal, with a pair of glorious smoked country style ribs as the main attraction. I decided to include a few healthy choices, adding a few slices of fresh red bell peppers, cucumbers and red onions to the plate. I smoked a few whole potatoes along with the ribs, and those turned out great too! Leftover baked beans finished off my massive plateful of grub. Oh, and the ribs were topped with one of my homemade barbecue sauce recipes, a Captain Morgan sauce that I came up with several years ago... but that's another story! It was a very satisfying meal. I didn't even need to have seconds! Combine the dry rub ingredients, mixing well. To break up any brown sugar chunks, push the mixture through a coarse mesh sieve. Combine the vinegar basting sauce ingredients. Season the ribs on all sides with the spicy dry rub mixture. 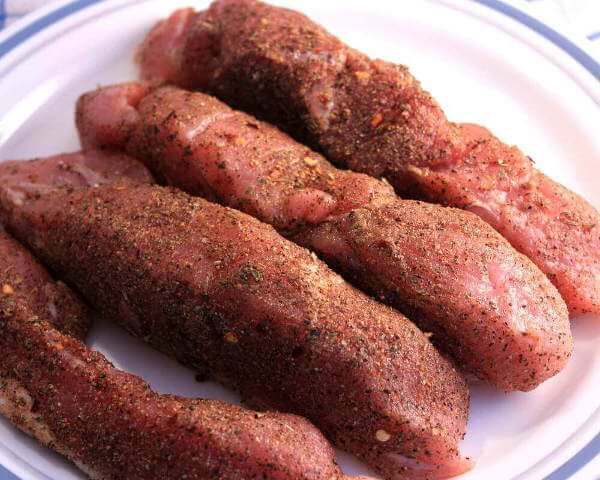 This is a flavorful rub, so don't pack it on thickly - unless you can handle the heat! Set up your smoker, adjusting for a smoking temperature of 240° degrees. I used hickory wood chips for this recipe, but use what you think appropriate. It's ok to experiment a little! 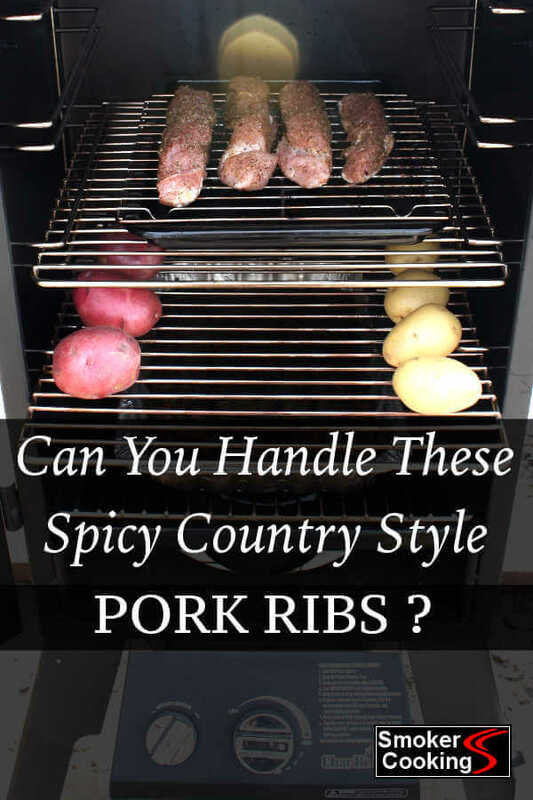 Place the country ribs on the upper rack of your smoker. Allow them to smoke for one hour before basting for the first time. Continue basting every half hour until the ribs are done. After the initial load of smoker wood has burned out, add one more small load of chips. Since these ribs are relatively thin, they don't need a heavy dose of smoke. Keep the ribs merrily smoking at 240° until their internal temperature reaches 145°. Remove them from the smoker. These can be served immediately - there's no need to rest them after they're taken out of the smoker. Serve these as I did, with an assortment of sides, or just grab one and devour it all by its lonesome self!